SCREW YOU, BEAR DAD! 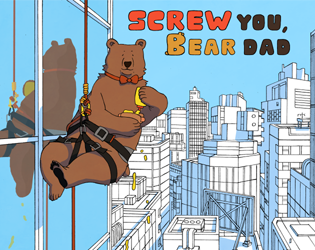 by Xalavier Nelson Jr.
"SCREW YOU, BEAR DAD is smart, silly and meta, which are all things that make a great interactive fiction game..."
"...it is fun and silly – there are bear puns galore and I laughed a lot. But it's more than that, too." "I found myself reflecting on how prejudice and racism in society leach inward into the family, affecting even the closest relationships; and on how long it can take as an adult to understand what your parents were trying to overcome when they raised you. Which may be a surprising thing to find in a game full of puns about air-dropping bears." Originally released as part of IF Comp 2016.